The picture gives information about the nine planets in our solar system and Pluto, in order of size. 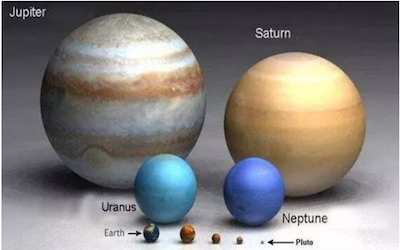 According to the picture, it is obvious that Jupiter is the largest and followed by Saturn. We can also see that the third largest planet is Uranus and the size of Neptune ranks fourth. Then we can notice that our beloved earth is the fifth biggest planet in the solar system, followed by Venus, Mars and Mercury. It is also not surprising to find that Pluto is the smallest one among the nine planets. In conclusion, we can say that the solar system includes the Sun, planets, and other objects.